Sorry for the radio silence thats been happening here. Work has been CRAZY and I've barely had enough time to do things like eat and sleep so obviously this has gone by the wayside. I decided to share a little project I've been working on since the beginning of January. Last month I shared that my word of the year is Strength. One of the things I wanted to prioritize in my life is my making! Creating things (food, writing, crafts, ect) is a very fulfilling outlet for me and I let stress and busyness take over last year. These things keep me from creating so I decided to make my creative self a priority this year. 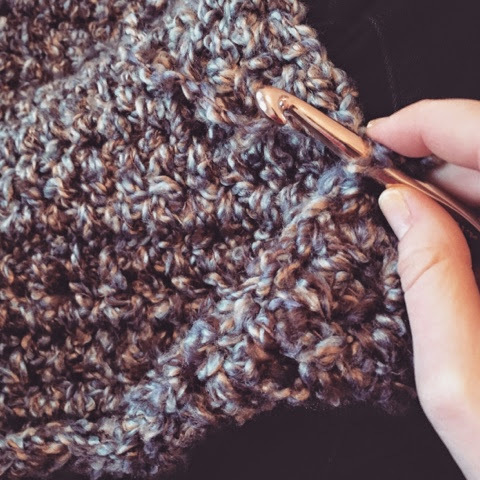 I started 2015 with a go big or go home attitude and after just learning to crochet I started an afghan. After Christmas Michael's had a huge sale on their yarn so I bought a few skeins of Loops & Threads Country Loom. Its a chunky brown, tan, and blue mix and its beautiful. After starting and realizing that each skein of yarn is barely a few inches, I measured it out and ending out buying enough so that it will be around 13 skeins of yarn. I have had some issues. 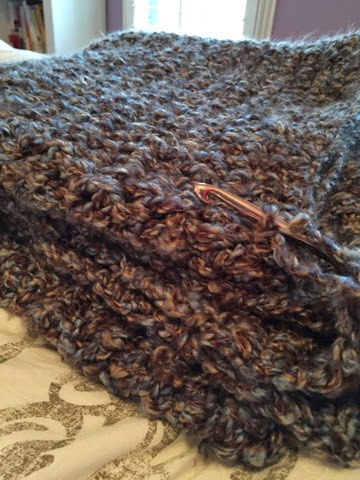 One day when I was catching up on Downton Abbey I made a ton of progress only to realize later that I had lost a stitch every row I made and my blanket was suddenly becoming a triangle. I had to take out 10 rows which was upsetting. I've finally gotten past where I was before and I'm optimistic about the progress. What I've been trying to do is at least one row (about 80 stitches) every night. It takes 10-15 minutes so at least one row per day is doable. I also try to work on it when I'm watching TV, now lay it out after every row to make sure that I didn't make any major mistakes. I've been tracking my progress with Elise Joy's Habit Progress printable. 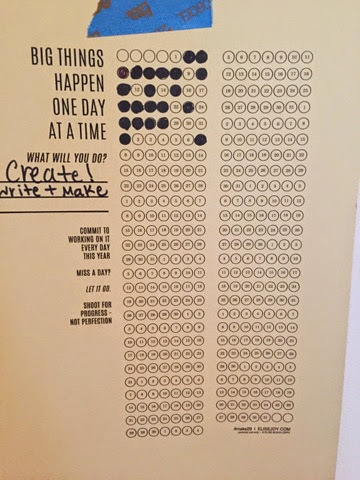 Each bubble has a number (for the date) and I fill in each day that I do it. As you can see from this past week, I didn't get any creating in. I'm working on fighting the stress and exhaustion to keep on making, but its a never ending battle. As the printable says, its about progress not perfection. It would be awesome if I could finish this by the end of the month and be able to use it to keep warm before spring! I'll continue to share progress.